Betsy DeVos on Capitol Hill in Washington on Jan. 17 at her confirmation hearing before the Senate Health, Education, Labor and Pensions Committee. Betsy DeVos was barely confirmed, 51-50, as secretary of education on Tuesday. Two Republican senators, Lisa Murkowski of Alaska and Susan Collins of Maine, joined with every Democrat in opposition to DeVos’s confirmation. Vice President Mike Pence broke the tie in DeVos’s favor. DeVos’s 50 “no” votes are the most received by a secretary of education nominee since the position was first established in 1979. Secretary of education has been among the least contentious Cabinet positions: Only three of the previous 10 nominees received any “no” votes at all. But it’s not just DeVos. She is only the latest of Trump’s Cabinet and Cabinet-level nominees to face an unusual amount of opposition in the Senate. Newly elected presidents are typically afforded wide latitude in picking their team — before this year, only one of the last 109 Cabinet-level nominations from new presidents, dating back to Jimmy Carter, has been rejected in a vote (five others withdrew). Many nominees are confirmed simply by unanimous consent or a voice vote, which are generally used when there is no substantial opposition and no desire to record individual votes. But all six of the Trump Cabinet-level nominees confirmed by the Senate so far were voted on via a roll-call vote. As of Feb. 7, 2017. Only six of Trump’s Cabinet-level nominees have had confirmation votes. And even with only six Cabinet members and Cabinet-level administrators confirmed so far (not including Mike Pompeo, the CIA director, who received 32 “no” votes but isn’t considered Cabinet-level), the Trump administration is on track to have the highest number of contested confirmation votes since at least the Carter administration.1 Ronald Reagan currently holds the record, with eight of his nominees receiving at least one “no” vote. Obama had been in second place with six contested votes, but Trump has already tied him. And the political website Decision Desk HQ has identified four other Trump nominees who could face close votes. Trump’s nominees have faced opposition for a variety of reasons, including concerns about Secretary of Homeland Security John F. Kelly’s position on immigration and issues with Secretary of State Rex Tillerson’s potential conflicts of interest as a former CEO of Exxon Mobil. DeVos faced questions over her commitment to public education and how prepared she is to lead the Education Department, among other issues. Still, it remains to be seen if the increase in contested confirmations is a Trump-specific phenomenon or the continuation of a trend. 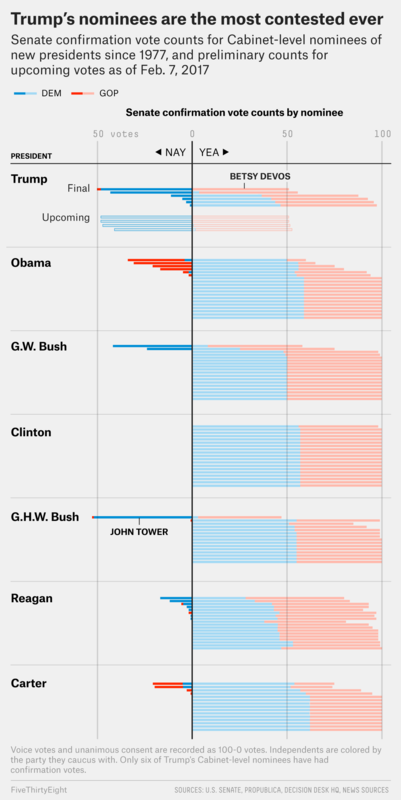 Obama’s initial batch of nominees also received more opposition than had been typical. And the previous record for “no” votes for an education secretary, before DeVos, belonged to the last person to the hold the job, John King, who had 40 “no” votes. Amid ever-growing political polarization, it’s possible that the era of uncontested Cabinet confirmations as a default has passed. Harry Enten and Nathaniel Rakich contributed research. That’s as far back as the Senate Historian’s office has data.